A full house of derby fans packed Esquimalt’s Archie Browning Arena Saturday night (April 7th) to witness two high intensity battles featuring the Eves’ house teams; The Belles of the Brawl and The Margarita Villains who took on the Sea to Sky Sirens from Squamish and Nanaimo’s Harbour City Hydras, respectively. Both games ended in decisive wins for the home teams. Kariac Arrest was named the Belles of the Brawl MVP Jammer, while team Co-Captain Hot Piece-Of-Sass was named MVP Blocker. 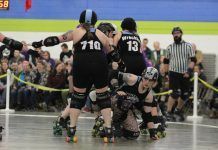 MVP’s for the Sea to Sky Sirens were Va Va Voom La Doom and Roller Square. Fat Bottomed Hurls was named the Margarita Villains MVP Jammer, while Felix the Brat was named MVP Blocker. MVP’s for the Harbour City Hydras were Jonestown Mascara and Fanny in the Pack. 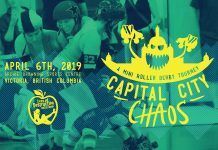 Your next opportunity to see roller derby in Victoria will be May 19th: The Rotten Apples vs. The Tempest and the The Hard Cores vs. Aftershocks Roller Rebels.